Then there is the trend towards targeted point solutions with very domain-specific capabilities to create these smaller chunks of content. A generic word processor is far from efficient in this scenario, and even harder to customize with the desired user experience. Content creation applications are so much more powerful in a business context and becoming less focused on text. It’s fun to read about a trend – in this case Component Based Authoring – when you’re already practising this approach. It feels for me as if this is the only way forward in case based solutions being delivered today. My current project is implementing an EMC xCP based solution to support a decision making process where each decision is backed by carefully build cases. In its previous implementation, documents were the content containers. A lot of copying and rewriting was taking place. A cumbersome and error prone way of working. We didn’t investigate it, but if I were to place a bet, I would say that it’s almost a guarantee that each document is formatted uniquely and it’s highly likely that not every document contains the mandatory information. The flip-side of the coin is, that this freedom is very well received by the end-user who is using Microsoft Word, a tool perceived as very user friendly and productive (don’t get me started…), to let his creativity flow. You could argue that the needs of the end-user are prevailing over those of the enterprise. At Informed Consulting we believe that connecting people and the enterprise should be a win-win situation and is key to success. 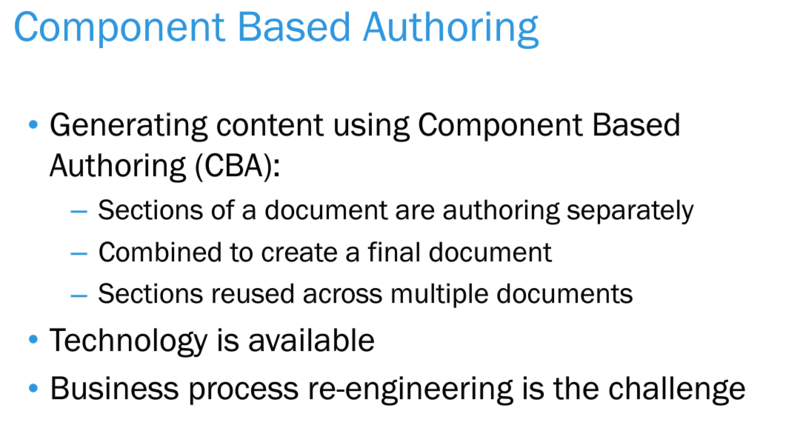 With the new xCP solution we’re applying Component Based Authoring and Word is now only needed for the supporting documents. Not for the key information of the case. That key information is divided into logical components and authored independently. With this approach we created a balance between both user and enterprise needs. But in order to achieve this, more is needed than just solving the challenge of business process re-engineering. In fact, in this case the process is hardly changed. Once you know what key information you need to capture, it’s time to let the UX (user experience) designer do her thing. My colleague Sandra did a tremendous job with the key users, to design screens for both capturing and displaying information. There has to be a natural order in the information that fits the way of working in the business. This means defining where on the screen a content component is positioned for a particular role (yes, different roles will typically lead to different positioning…), which content components need just plain text formatting and which need rich text to be able to add lists, mark text bold or even include hyperlinks but on the other hand prevent the usage of fonts other than what the corporate style-guide dictates. It means defining where you need to restrict input to predefined taxonomies (or just simple drop-down boxes populated with values) and where you need supporting wizards. A sample of the latter is one where the user provides answers and numbers after which the system draws a conclusion that is used as input for the decision. To cut a long story short, information with a good user experience will help to make the transition into component based authoring smooth. Another key aspect is the transition from paper to digital. A topic on its own. In our project we opted for a gradual transition because it’s more than a business process change to replace meetings full of annotated documents, prepared off-line over the weekend, with information accessed digitally through tablets and laptops. As an intermediate, the individually authored content components are aggregated in PDF/A documents. These documents are available for on-line reading as well as printing. It’s now up to the business themselves to execute the behavioural change process. In the mean time they can still print and scribble away where and whenever they want. Times are changing in the ECM playing field. New ways of working, progressing technology, distributed collaboration and blurring boundaries pave the way into an interesting future. Next-Gen ECM / Next-Gen Information Management… Welcome into my world!